The U.S. Library of Congress is a treasure trove of historical data. Much of the information stored there (which is technically part of the deep web) is copyrighted. But, periodically the Library releases images and other information that is “Free to Use and Reuse”. Recently the Library added a small batch of cycling images to this category. Some of these free images pose questions. 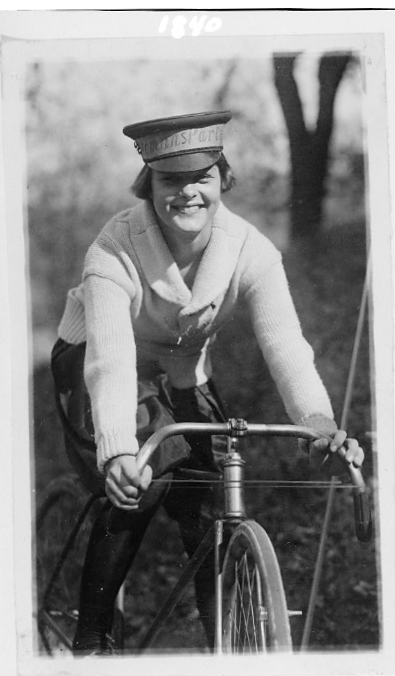 In the above photo, Ms.Obear, a cycling messenger for the National Women’s Party, is astride a traditional diamond-framed bike, with wide drop bars, large wheels, and no apparent rim brakes. In the above photo you can see that this cyclist is riding a fixed gear machine, sans any rim brakes on the front or the rear. There is twine run between the two ends of the handlebar (why?) and this cyclist is wearing some stylish cycling couture, with comfortable low heeled shoes. 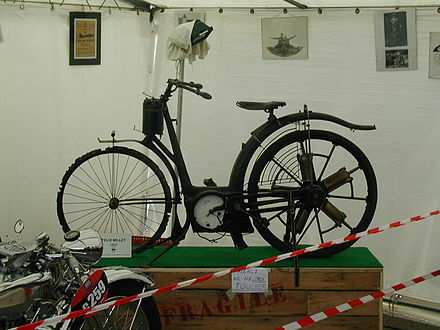 The large chainring and small cog at the rear wheel makes it seem that this bicycle was set up for training. 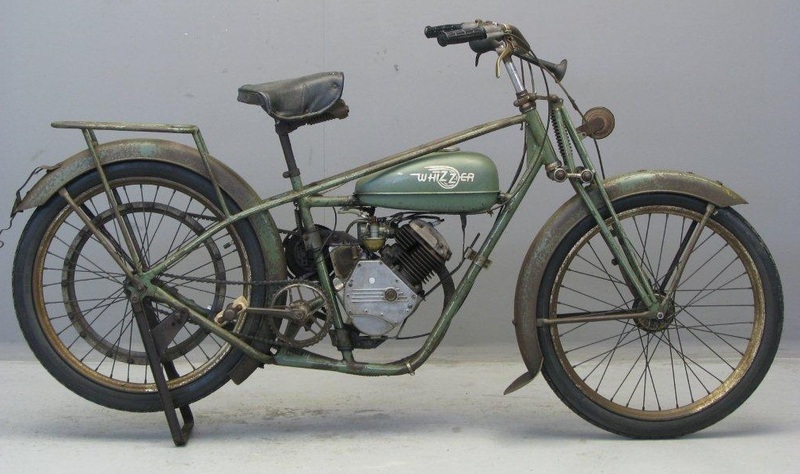 One must remember that in these early days of cycling, huge gears were more the norm, and cyclists would typically dismount to ascend steep hills. Were these cyclists stronger than their modern day counterparts? 1942 Washington DC family out on a ride. 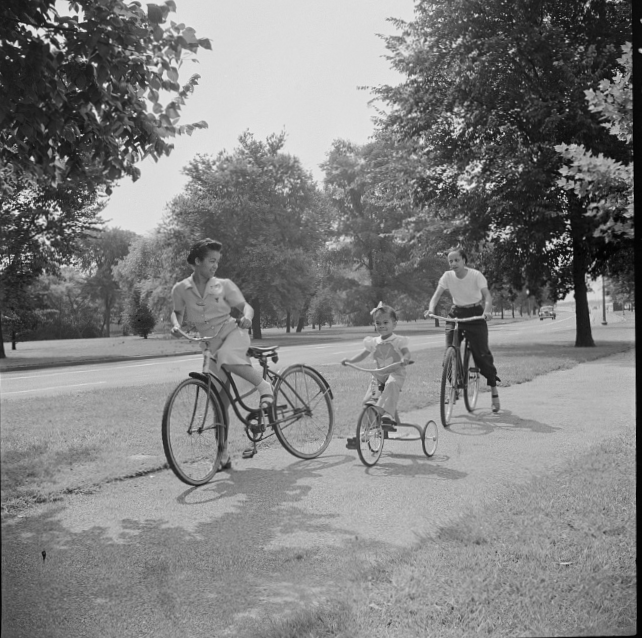 Another interesting photo in the Library of Congress’ free archive is this 1942 photo of a Washington D.C family out on a cycling adventure. The child is astride a substantial looking kids’ trike, and her parents are riding American cruiser style bikes of this era. I have to wonder where that little girl is today, and if she is still alive and still riding. 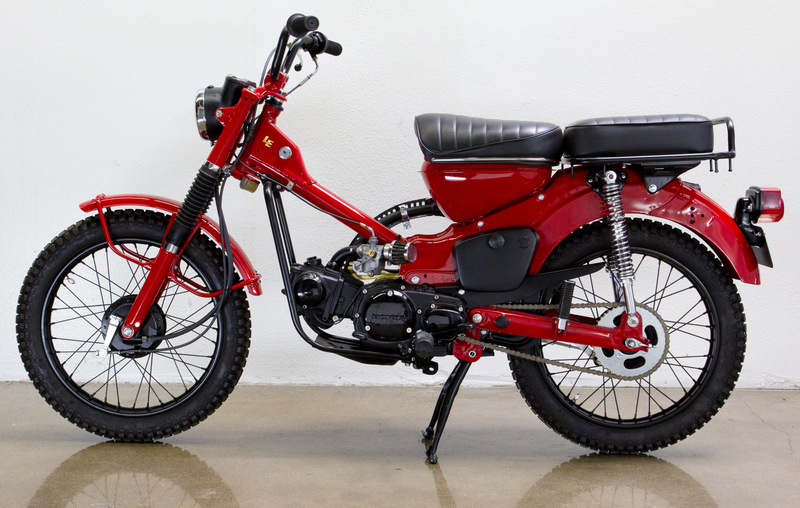 Fast forward to the 1970’s and we have Hertz getting into the biz of bicycle rentals. 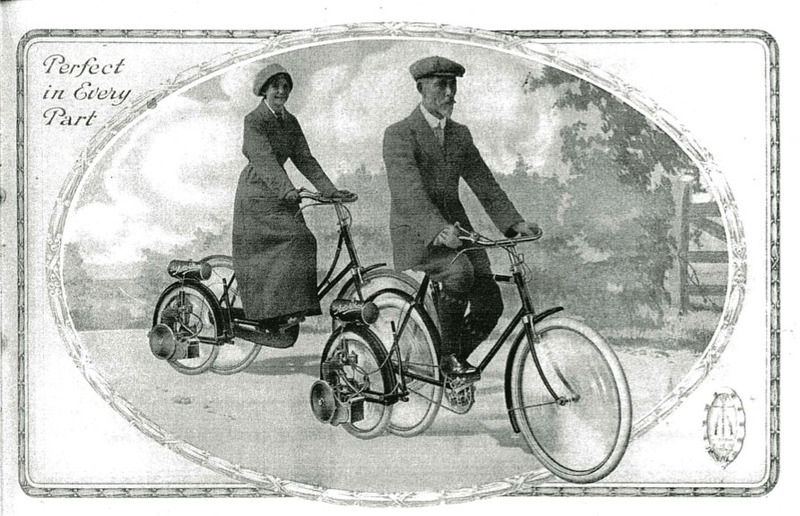 A precursor to bike share? 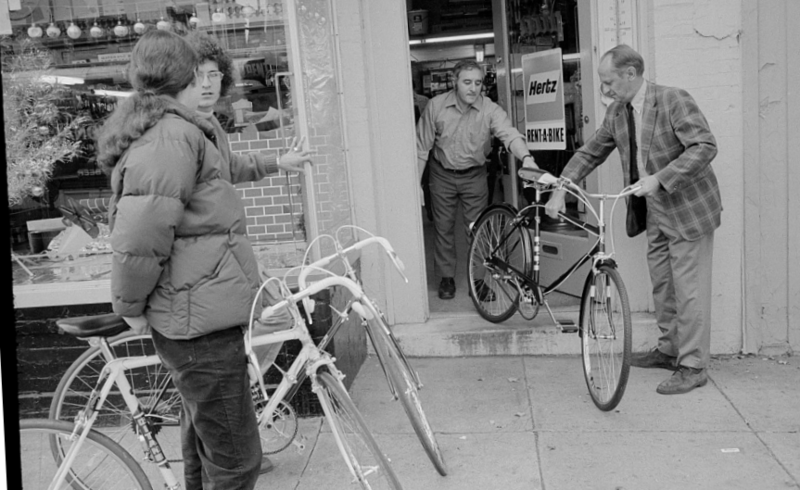 The outermost bike at the lower left of the photo is a Gitane, equipped with centerpull brakes and downtube shifters. 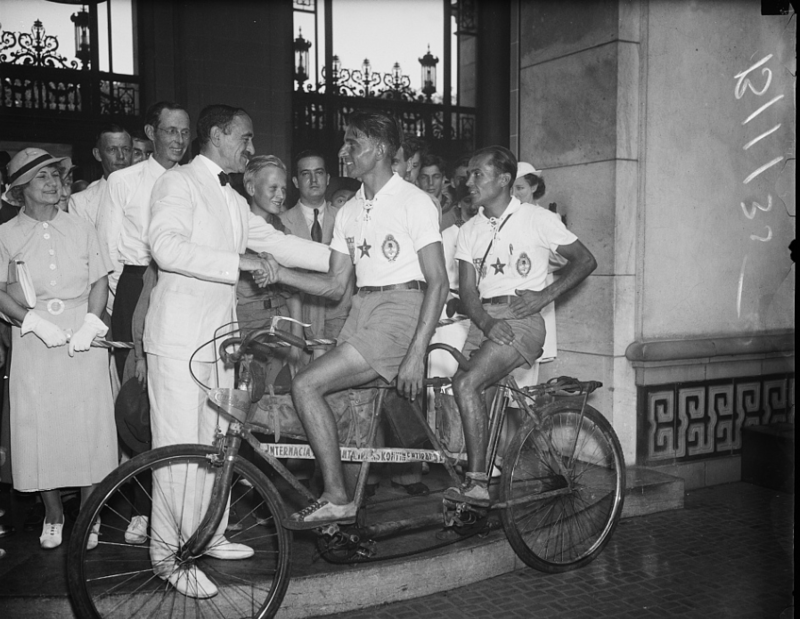 The above photo depicts a pair of cyclists who started out in Buenos Aires in 1934 on a tandem machine, pictured above, who arrived in the U.S. two years later, alive and well. 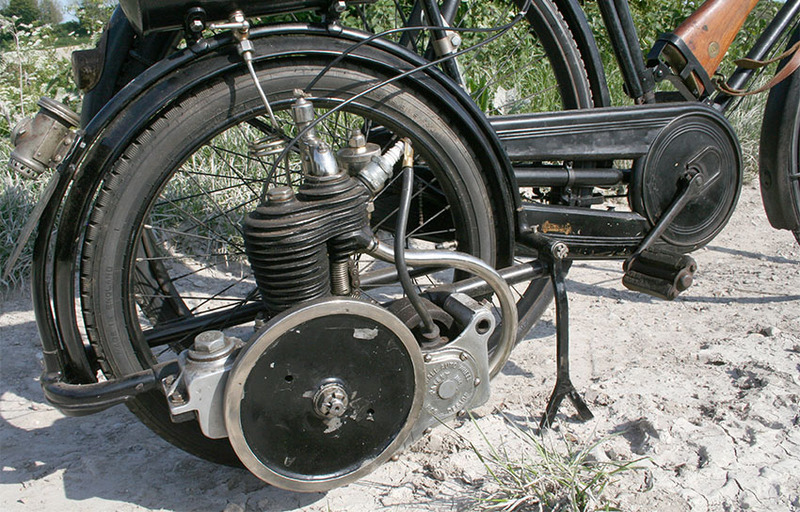 The vintage tandem has rim brakes, front and rear, with the captain’s levers installed on the top of the upright bars. It looks like there are two chain rings up front, but it’s hard to tell if there is a rear derailleur. Either way, this journey is impressive. 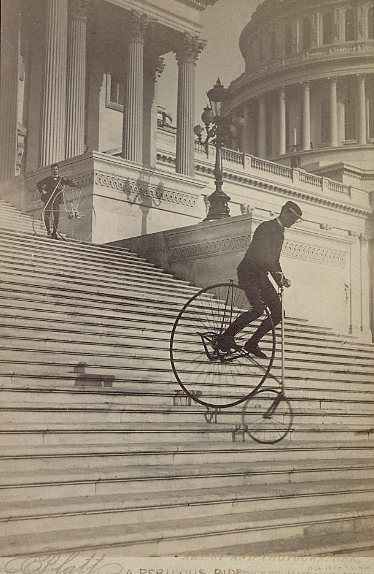 If you are going to ride down a stairway, maybe first you should try to source a bike with a huge rear wheel. That is probably what made the above feat possible. 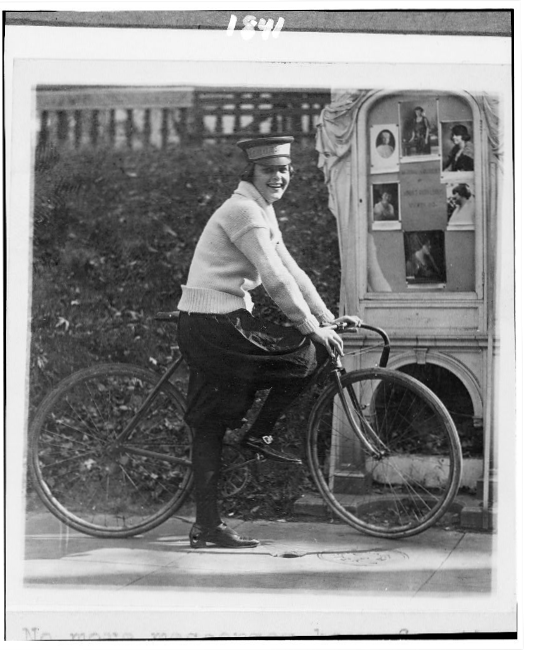 There are many other free to share images at the Library of Congress, and not just in the category of cycling. I hope you have enjoyed these images, and for more, look here. Visiting my local Powell’s bookstore involves a normally direct route to the back of the store where the cycling section resides among the other sports related tomes. 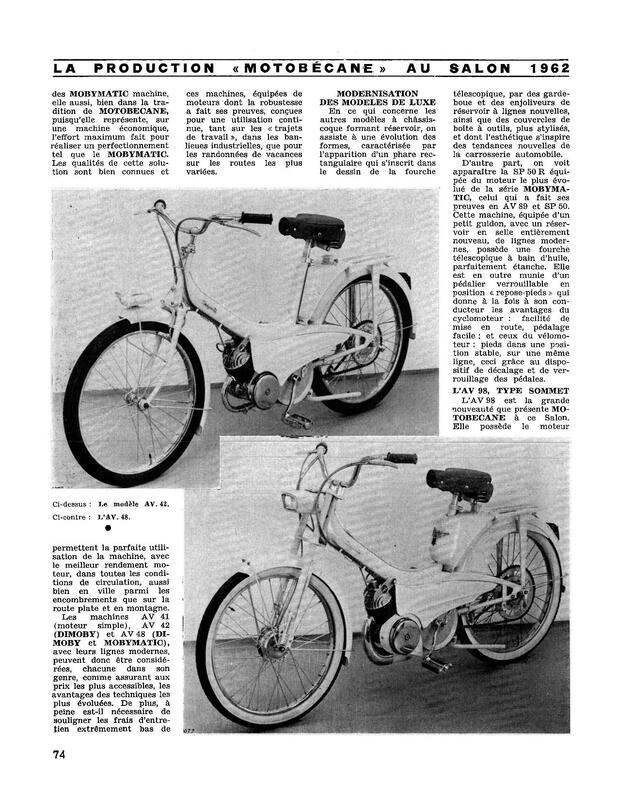 I am always on the hunt for vintage cycling repair manuals from days of yore. On this recent jaunt, nothing of interest emerged from the crammed bookshelves. So, I did a visual 180 to make sure I had left no book unturned, so to speak. That’s when I spotted this out of place manila envelope which was “sealed” in a clear cellophane package. I picked it up, turned it over, and saw that the cellophane was closed with a piece of white cloth tape of the kind which can easily be gently unsealed. Temptation number one. As I gazed upon the lettering on the front of the envelope I handled the envelope to feel the heft of the packet and to surmise what it might contain. I thought: is this a hoax? 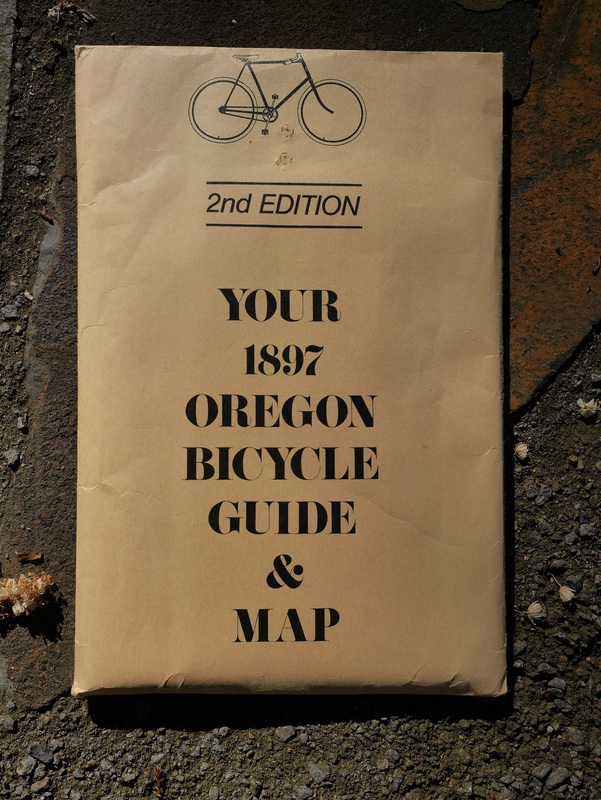 Could there even be a cycling guide to (my) Oregon, complete with map, which was published back in the late 1890’s? The manila envelope was clearly not 100 years old, so I was suspicious. The cloth tape seal proved irresistible, and soon I had the contents in my hands. I had decided I would buy the merchandise regardless of what I discovered, so undoing the cloth tape and removing the contents was just part of my “due diligence”. 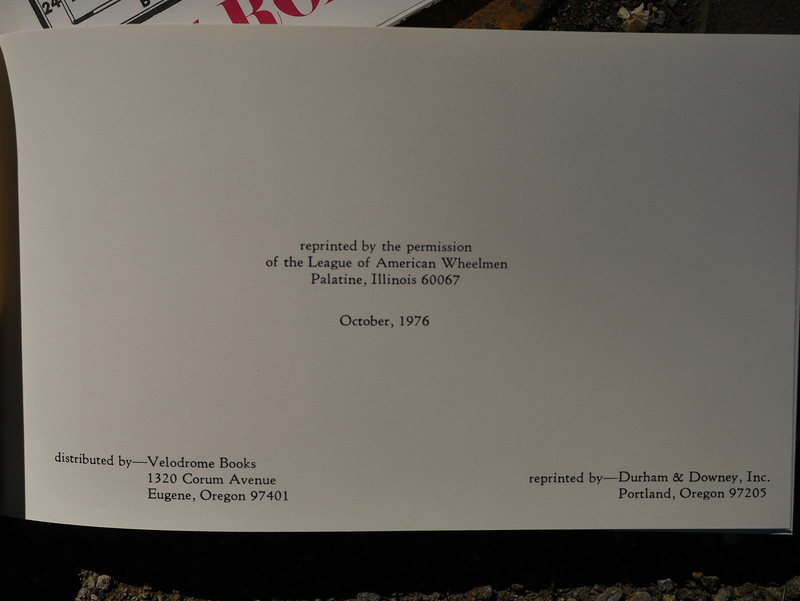 Neither the publisher nor the distributor of this 1976 reprint are in business today. 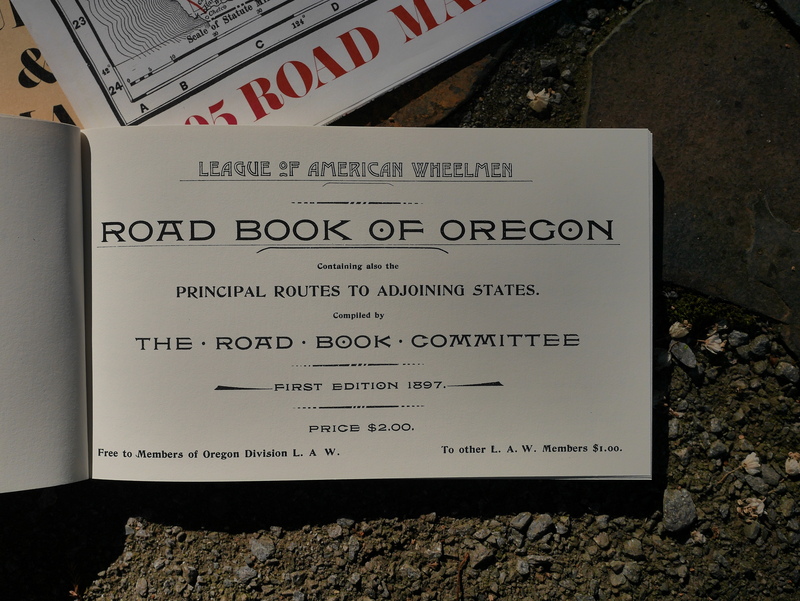 As it turned out, this was a 1976 reprint of the Road Book of Oregon, first published by the League of American Wheelmen in 1897. This organization is very old, having been formed in Rhode Island back in 1880. Yes, you read that correctly. 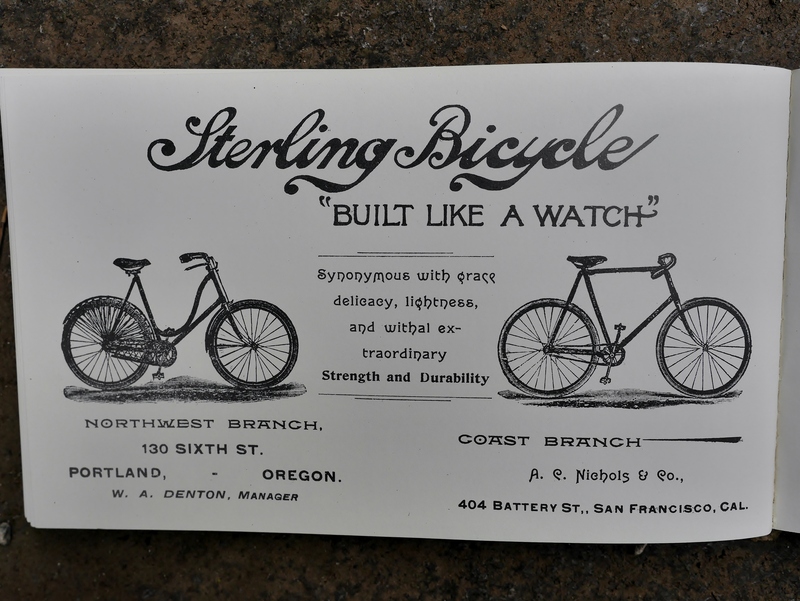 As hard to believe is it may be, this organization which originated from the late 19th century culminated from the need to unite cyclists of this era in the burgeoning cycling movement of the time. This was before the first automobile was invented, and long before paved roads and highways were in place. This was America, with its huge distances from place to place – a seemingly great obstacle for cyclists of the time to surmount. The organization started as a racist one (which was not officially remedied until 1999), and excluded its membership to whites only. When I read these words I felt sad, enraged, and a number of emotions that are hard to describe. 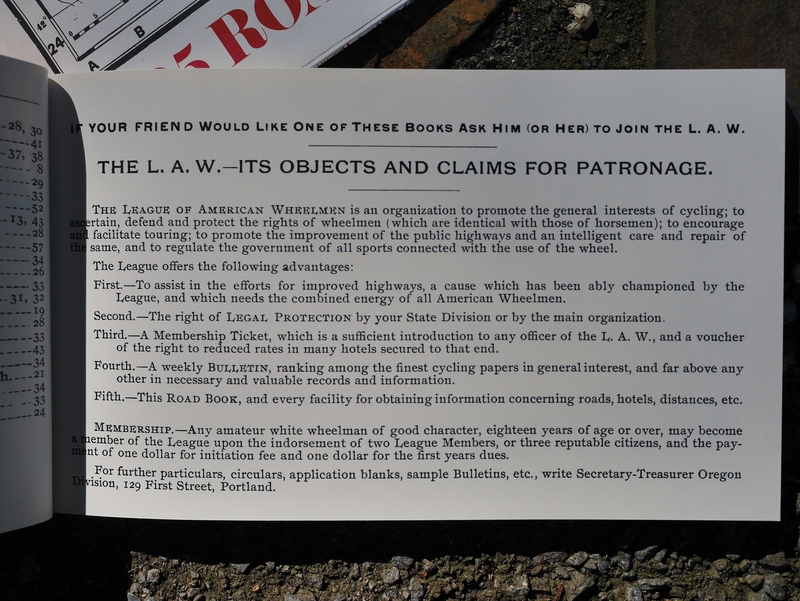 The cycling industry has a deep rooted history of sexism and racism, and reading the “membership requirements” made me experience the stupidity and inhumanity of our racist past. I would be grateful to hear how other readers of this blog respond. 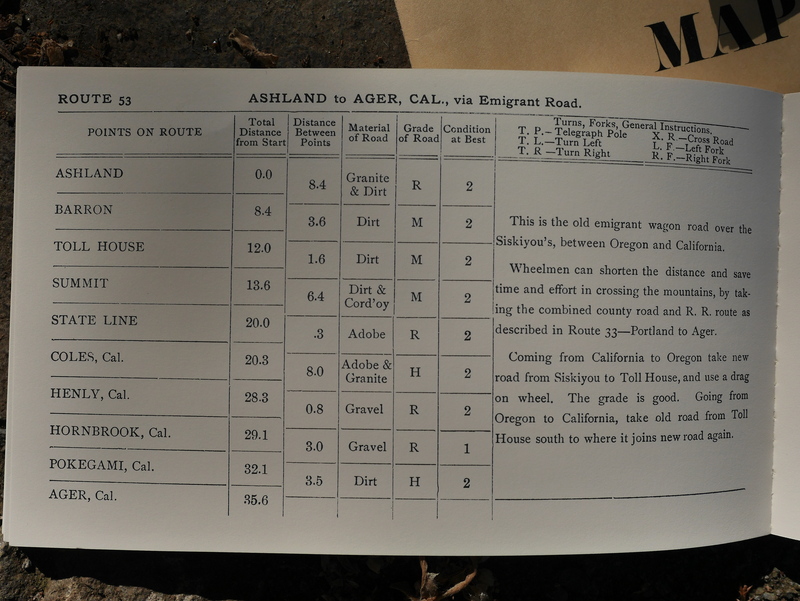 Reprint of 1895 Oregon road map. You can see the precursors to all the major roads and highways of today. Close up of the Southern Oregon section of the 1895 map. 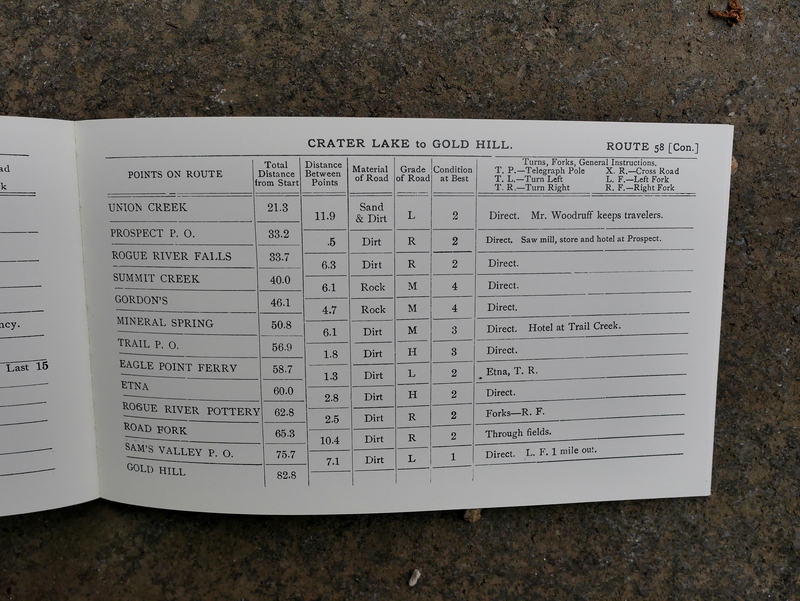 It includes topographical info as well as identifying by name every small town or rural outpost of the time. In Union Creek, Mr. Woodruff “keeps travelers”. How to get from Ashland to California over the mountain passes. 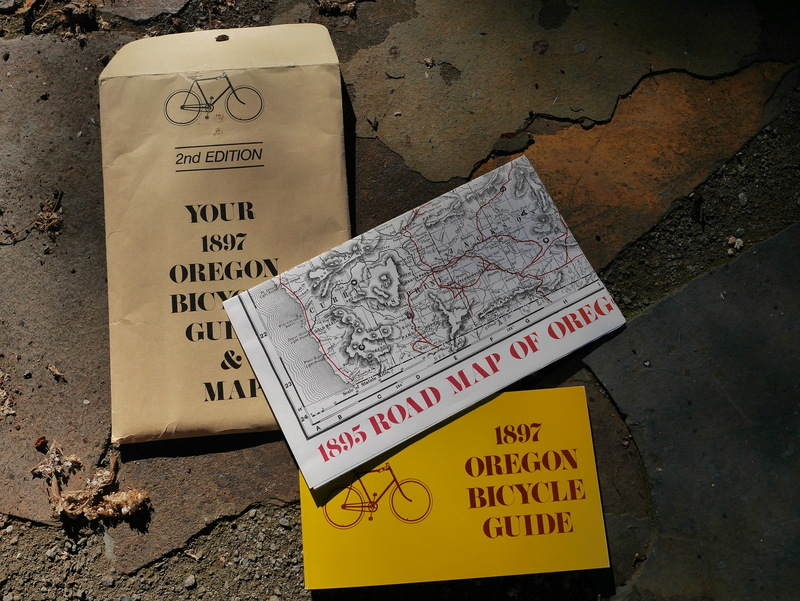 The little booklet contains route descriptions for bicycle adventures over the entire state of Oregon, Including charming references to local folks who “take in travelers” when cyclists might arrive at their rural farm unannounced while en route to distant environs. The road conditions, mileage, and estimated difficulty are included in each route description. 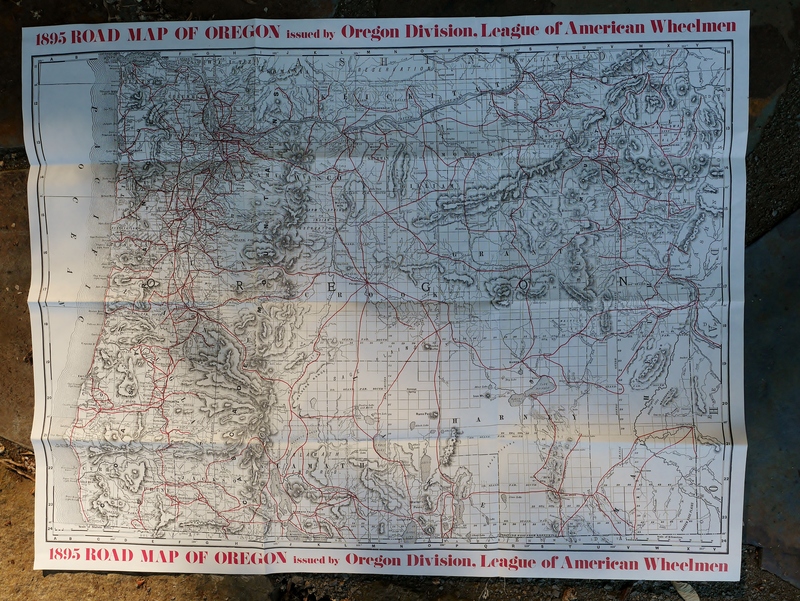 The mysteriously labeled envelope also included a large fold out map of the available roads in Oregon in 1895. When you consider that wagon trains were headed west on the Oregon trail just 50 years earlier (wherein many white settlers died on the way and wherein many resident Native tribes were displaced or wiped out by diseases or combat) it’s fascinating and sobering to take in the extent of the road development by this time in history in the Pacific Northwest. 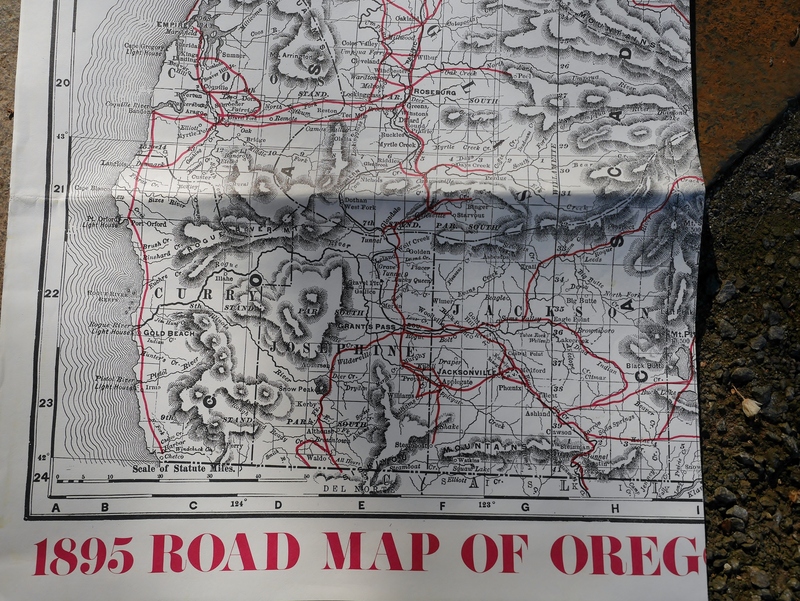 The booklet contains 59 routes, covering the entire state of Oregon, as well as passage to the bordering states of Washington, Idaho and California. 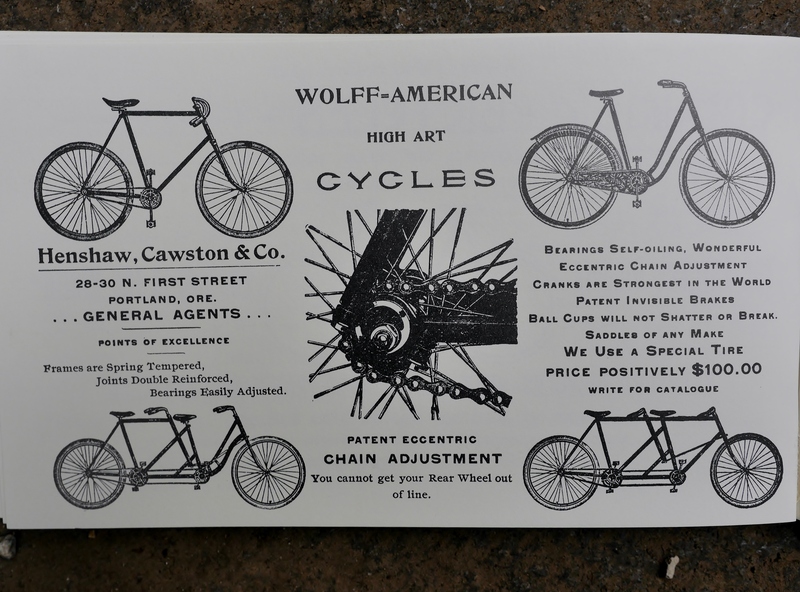 At the back of the booklet are advertisements from American bicycle manufacturers of the late 19th century. 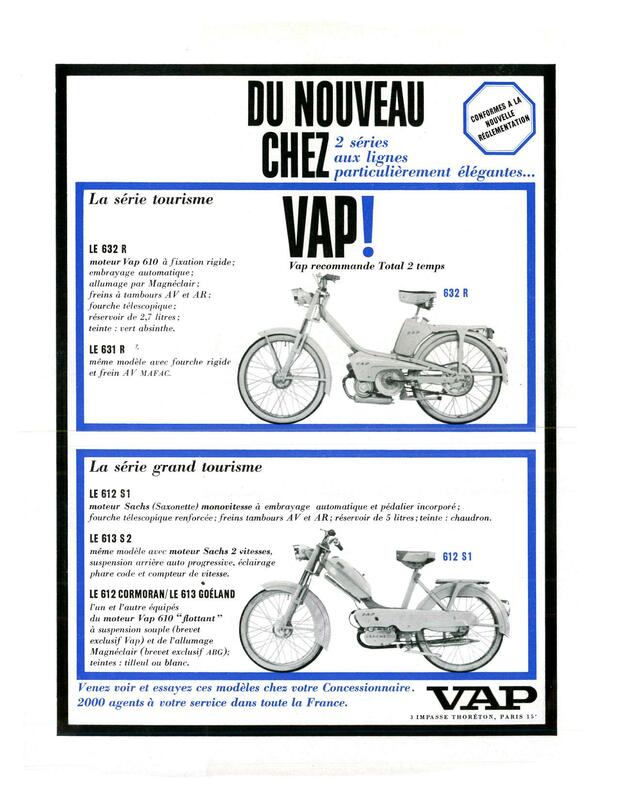 There were some companies that I hadn’t tuned into before, such as Wolff-American and Sterling Bicycles. 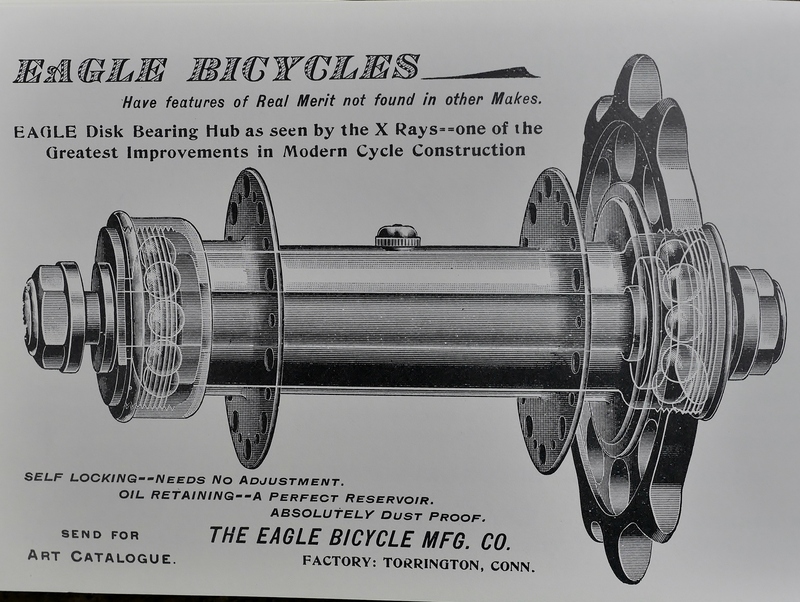 But, I especially enjoyed looking at the drawing of the Eagle Bicycles “Disk Bearing Hub as seen by the Xrays”. These are described as self locking hubs, which never need adjustment. 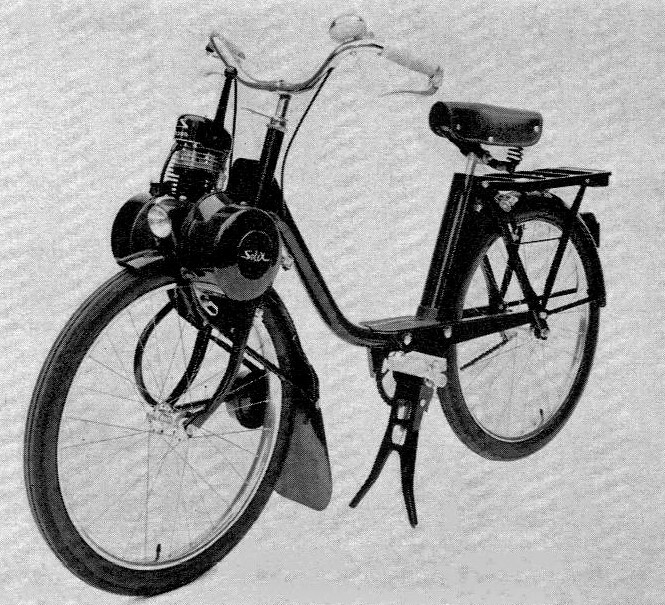 I would surmise that these components are an early example of cartridge bearing hubs, proving once again that many cycling “innovations” have been around for a long, long time.